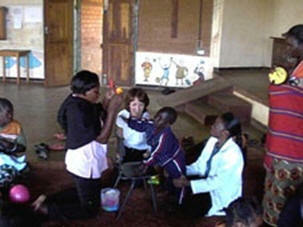 Cerebral Palsy Africa has been working in Zambia since July 2006. 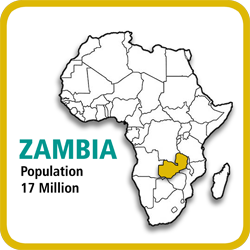 Our partners in Zambia are the Zambian Association for Physiotherapists in Cerebral Palsy (ZAPCP), Action on Disability in Zambia (ADD Zambia) and the 'Apters' who have run their Paper Furniture APT Workshop in the grounds of the main teaching hospital in Lusaka for almost 20 years. We were delighted to be able to support our two Zambian trainers to run their first course alone with no CPA trainer present. 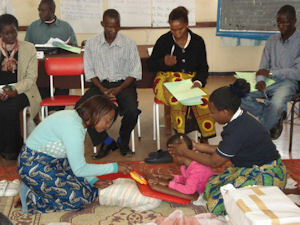 Micah Simpamba and Prisca Kalyelye ran a course, in November 2010, covering the assessment and handling of children with cerebral palsy for 16 Community Based Rehabilitation (CBR) workers attached to the Ndola Diocese Community Based Rehabilitation Programme in the Copperbelt. All of the participants felt they had learnt a great deal from the Workshop especially the practical aspect. These were the same CBR workers who did the APT course with Jean last year so they are now very well able to work with children with cerebral palsy. Jean and Ken Westmacott took three other volunteers with them to the Copperbelt to help set up workshops which will be used by the Community Based Rehabilitation workers attached to two different programmes, Wukwashi wa Nzambi and Ndola Community Based Rehabilitation to make chairs and standing frames. The workshops were arranged to have workstations to ensure efficient production and tools were supplied. Training reminders on measuring children, using good APT techniques, working with therapists and the adjustments that may be necessary for producing made-to-measure chairs and standing frames were also given. Before they left the trainers made sure that those who would be working in the workshops were put in touch with physiotherapists who could prescribe equipment for the children and organisations who could help them to collect cardboard. Kennett and all three of the volunteers raised funds for their own fares and the course was extremely productive with each participant making a piece of equipment to take back to their workplace. 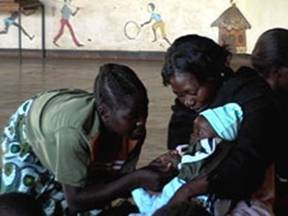 In July and August 2010 Dr Lesley Dawson and Patsy Rochester spent two weeks in Zambia with the general aim of increasing the capacity of Zambian Association of Physiotherapists in Cerebral Palsy (ZAPCP) in serving the needs of its members. The aims of this visit were to advise ZAPCP how it can provide specialist training for members, develop the capacity of ZAPCP to run training programmes and advise ZAPCP on how to link courses to local academic institutions so that they will have national recognition. It was also hoped to enable ZAPCP to convince local government and non-governmental agencies that the courses taught should be locally funded and valued. In order to achieve these aims they ran a training of trainers course for 50 physiotherapists from all over Zambia which was a huge success: “very comprehensive, detailed and exciting, educative and interactive”, were some of the comments. In addition they ran two short training sessions on “Negotiating Skills and “Suggestions for Improving Committee Meetings”. Accompanied by Prisca Kalyelye, they met with the Deputy Director of Clinical Services in the Ministry of Health at which they discussed the possibility of the MOH supporting the training programmes that ZAPCP can now undertake. Cleto Mweemba, the physiotherapist employed at the MOH agreed to continue to pursue this. All in all it seems ZAPCP has benefited a great deal from Lesley and Patsy’s visit.